Tempers flare and swords are drawn in Minnesota Opera’s production of Roméo et Juliette. Photo by Dan Norman. 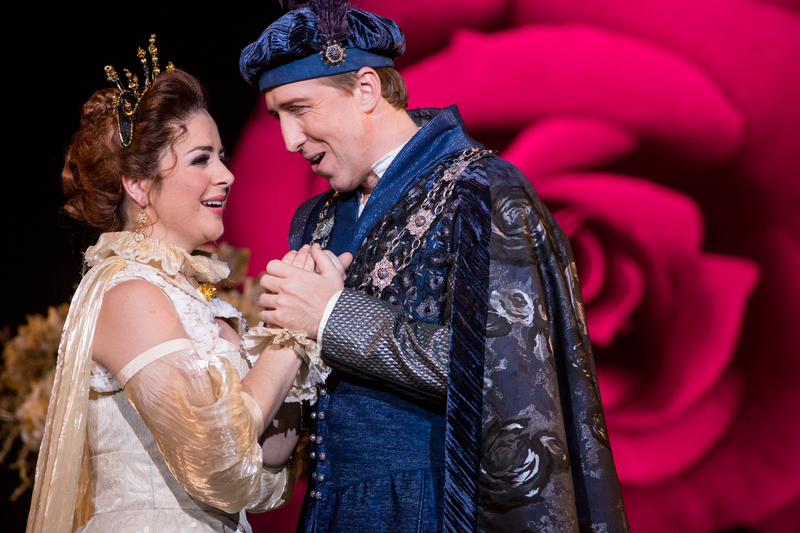 Minnesota Opera kicks off the 2016-2017 season with a sparkling and stylish reimagining of Roméo et Juliette, Charles-Franҫois Gounod’s 1867 adaptation of Shakespeare’s classic tale of famous star-crossed lovers caught between two feuding houses. A cast showcasing several new and former members of the Minnesota Opera Resident Artists program gives this production a youthful energy, and the captivating visuals offer a fresh take on this well-told tale. The Nurse is accosted by some burly men. Photo by Dan Norman. As Juliette, Angela Mortellaro’s crisp and agile soprano voice offers a fluttering girlishness to the role, and her energetic performance draws the eye throughout. In her sure-footed rendition of Act I aria “Je veux vivre,” Mortellaro shows a pleasing mix of delicacy and acrobatics in vocal interpretation, all while traversing tabletops and chairs, to the dismay of the much-winded nurse, Gertrude (played sympathetically by Nadia Fayad). Joshua Dennis as Romeo is comparably boyish in his portrayal, with a smooth and supple tenor beautifully suited to the French text. While Romeo shyly follows his comrades through their antics crashing the Capulet ball, he squares his shoulders with new confidence when Juliette appears—with the balcony scene’s aria “Ah! lêve-toi soleil,” Dennis is sweetly romantic and filled with a new certainty that seems to elude his character elsewhere. An intimate scene. Photo by Dan Norman. Other notable turns include Phillip Addis as the rowdy and vivacious Mercutio—Addis displays a nimble and expressive baritone in “Mab, la reine des mensonges” and an athletic command of the stage, making his fatal dual one of the evening’s real highlights (choreographed by Doug Scholz-Carlson). David Walton is tense and imposing as Tybalt, and Gina Perregrino is cocky and swaggering as the young page Stéphano, the unwitting instigator of the opera’s climactic violence. Under the stage direction of Matthew Ozawa, the opposing forces in the action are replicated visually onstage. The primary visual metaphor in play are roses and swords, hanging behind the action in various configurations as the story unfolds, underlining the conflict between the idealism of young love and the reality of worldly violence. Wiliam Boles’s sets and Paul Whitaker’s lighting design are stark and Spartan, contrasting with Sarah Behr’s sumptuous Elizabethan costumes. Juliette (Angela Mortellaro) and Romeo (Joshua Dennis) meet at the Capulet Ball. It is this seeming incongruity between set and costume that provides a more subtle visual metaphor. The black chairs, benches, and simple structures against a black backdrop give the impression of bodies suspended in space, a story happening out of time. The overlay of highly detailed, historically inspired costuming conveys the social dimension keeping the two lovers apart—rather than just a tragedy about love and death, this is a story about the cultural and social pressures binding characters into proscribed roles. At the outset, Romeo and Juliette appear in plain clothes, she in a simple red dress and he in a white shirt and black trousers; before the action begins at the Capulet ball, the other characters dress them and fall to either side of the stage—burgundy for Capulet, blue for Montague. In the opera’s finale, the two lovers are back in the same simple costumes, ornamented only with a white shroud. Shakespeare’s lovers are more easily seen as victims of circumstance and terrible coincidence, making the original play less of a tragedy centered on a single character’s fatal flaw and more of a series of unfortunate events brought on by forces from outside. 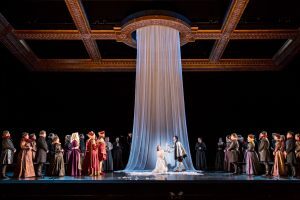 Gounod’s lovers in the new Minnesota Opera production are more intentional and overt in their rebelliousness and their threat to the status quo—rather than dying because they each believe the other is already dead (victims of miscommunication, essentially), Romeo and Juliette go to their fate together because their love is in direct opposition to the world that they inhabit. 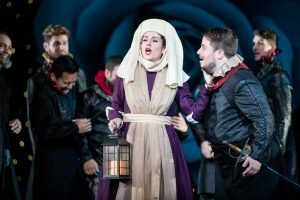 While Shakespeare’s lovers may have made it if the right letter had gotten there in time, Gounod’s lovers are truly doomed from the start, unable to escape into each other’s arms according to the structures surrounding them. The Minnesota Opera’s start to the season is vibrant, well executed, and breathes new life into an old classic. Roméo et Juliette runs through October 2 at the Ordway Center for the Performing Arts in Saint Paul, MN.